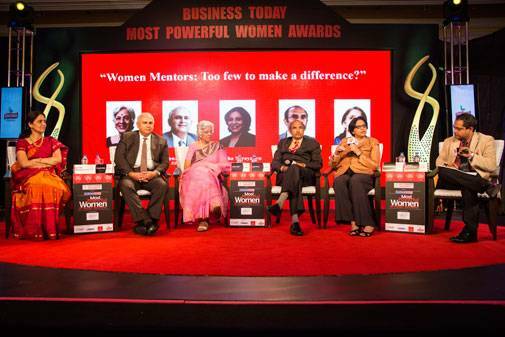 It was a power packed gathering at Business Today's Most Powerful Women in Business awards ceremony in Mumbai on September 22. The venue for the glittering event was the ITC Grand Central. 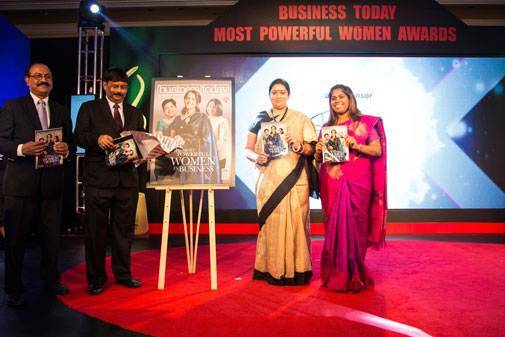 The awards were presented by one of the youngest ministers in the BJP-led National Democratic Alliance government, Smriti Zubin Irani, Minister of Textiles, along with India Today's Group Editorial Director Raj Chengappa and Business Today Editor Prosenjit Datta. The 30 winners were a virtual who's who in the world of business. As many as nine achievers were repeat winners, making it to our list this year too. These include RIL's Nita Ambani, SBI's Arundhati Bhattacharya , HUL's Priya Nair, Godrej Group's Tanya Dubash, Kotak Mahindra Bank's Shanti Ekambaram, VIP's Radhika Piramal, Apollo Hospital's Suneeta Reddy, Shardul Amarchand Mangaldas' Pallavi Shroff and fashion designer Anita Dongre. After releasing the special issue of Business Today , Irani in her addressed to the gathering of women professionals asserted that recognising and nurturing female talent will be the game changer in the coming years. "Continuous mentoring and nurturing is needed to encourage women to leadership positions," said Irani. The minister was in her elements, fielding questions from the audience with ease, adding a bit of humour to her responses and also making a point. "I never took refuge in my gender," she remarked. When asked by an audience member about how she entertains herself, the minister said in a lighter note, "No saas bahu ( for me)...my interest are watching legal shows and (relishing) food." There were as many as eight women who made a comeback to the list this year as they took on bigger responsibilities and put in a stellar performance. 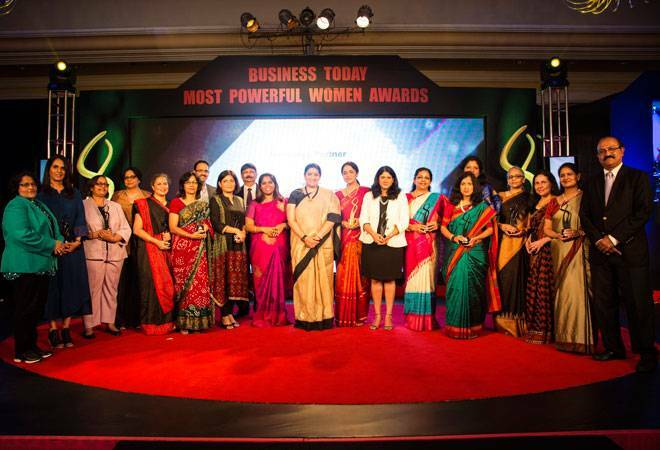 Prominent names in this category are ICICI Bank's Vishakha Mulye, Standard Chartered Bank's Zarin Daruwala and Crisil's Ashu Suyash. There were several talented professional's who made it to the BT's list for the first time, adding sparkle to the awards ceremony. The names in this category include TCS' Aarthi Subramanian, Jagran's Apurva Purohit, LIC's Usha Sangwan, COMPAT's Anita Kapur, LIC Housing Finance's Sunita Sharma , commerce secretary Rita Teotia, Kalaari Capital's Vani Kola and HCL's Roshni Nadar. It was also an emotional moment for three ladies who moved into the "Hall of Fame", after winning seven years in a row. 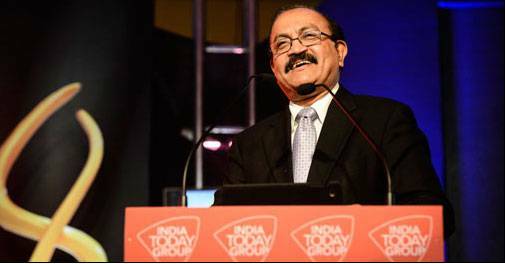 NSE's Chitra Ramkrishna, Lupin's Vinita Gupta and HP's Neelam Dhawan joined over a dozen other professionals who are already a part of this year club. Earlier, BT's Editor Prosenjit Datta, while welcoming the audience, had explained the significance of the awards and the methodology adopted by the jury to compile the list of winners. 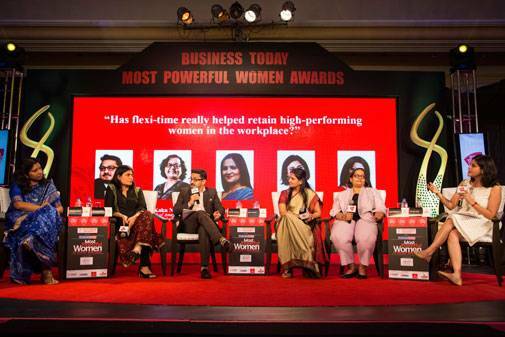 "It was from a list of 150 that the jury picked the 30 ladies who are anointed the most powerful women in business for the year because of their achievements over the past 12 months," said Datta in his opening remarks. The second half of award evening was equally interesting with two panel discussions keeping the audience riveted to their seat. The topic for the first panel discussion was, "Has flexi time really helped retain high performing women in the workplace?" The second panel debated, "Women mentors few to make a difference?"